For a long time I have been browsing the bookstores in Kolkata for a recipe book on sweets. On a self –reflexive note I remember with pleasure the sweet delicacies that were prepared post Durga Puja celebrations, i.e., the Bijoya Dashami. Bijoya Dashami marks the last day of Durga Puja when the idols are immersed in the Ganges which is followed by exchange of sweets. Sitting in the cubicle of library I remember with fondness the smell of molasses and grated coconut which my mother cooked with care for those perfect “nadus” which were to be offered to the Goddess during the Puja which would then be offered to the guests who came to commemorate Bijoya Dashami. The celebrations of Bijoya Dashami has now moved beyond the confines of kitchen and has hit the shopfloor of sweet shops hence the homemade delicacies like Nimki, Elojhelo and Nadu are stacked in piles in various sweetshops to be sold to celebrate Bijoya Dashami. Having spent a considerable time in an industrial township I had the pleasure of being treated to many Bijoya Dashami delicacies. There was a sheer joy in being invited to the households post play -time and being offered mutton ghugni, and sweets. Nimki, was a common item in the households and often kids preferred wearing frocks/ pants with pockets to stock them for the snack time post supper. And of course there were sweets of all shapes and sizes. To my delight, my mother thought that the best way to pass on some of these sweet treasures by gifting me a book “Mistikatha” a collection of sweet recipes by Jayasree Mukhoadhyay. Though I have not tried any recipes as of now but it will surely help me to put together a Bijoya Dashami get-together and a Poush Parbon platter without any glitches. The recipe book is divided into three sections. In Section I, Jayasree Mukhopadhyay documents “Dokane Toire Misthi” (Sweets prepared in shops). In this section she moves beyond rosogolla and shares with her readers recipes of Kanchagolla (a round shaped sandesh made of slow cooked chchana), Misti Doi (Sweet Curd) etc. The second section is dedicated to home-made sweets. This section is particularly interesting as it will introduce the novice cooks like us to sweet delicacies which could be prepared for the Bijoya Dashami evening and for a special get together to celebrate Poush Parbon(Harvest Festival) in December. For that perfect Bijoya Dashami evening you could stack up some Misti kucho Gaja, Elojhelo, Jibe gaja and Bhaja Malpua. And for that once in a while sweet cravings post dinner you can quickly prepare some Malpua out of sweet potato or even whisk away some Rasbara. Jayasree Mukhopadhyay successfully introduces to us a variety of Pithe ( stuffed steamed sweet cakes made of rice flour) like Ranga Alur Bhaja Pithe ( Fried Sweet cake made from Sweet Potato), Bhapa Pithe( Steamed Rice Cake), Raspuli( Rice Cake dipped in sugar syrup), etc. For all those who struggle with Palm based sweets usually offered during Janmashtami she guides us through sweet delicacies like Talksheer, Taler Bara, Taler Luchi, Tal Diye Malpua, etc. In the last section of the book she presents sweet recipes from other parts of the country. So in case you are nervous about the Bijoya Dashami and Poush Parbon celebration get hold of the book to take you through the sweet moments. Happy cooking! “Only gentlemen prefer Nahoum’s. This perhaps may sound bit of an exaggeration but there is no second confectionery in India that makes better baclava, cream rolls or fruit cakes. Now run by David Nahoum, the grandson of Nahoum Israel Mordecai, who came to Calcutta from Iraq in 1870, the confectionery takes anyone with a heart back to days when life was simpler, people had time to chitchat”. This Jewish bakery has also introduced Calcuttans to the taste of Cheese Filled Sambusak and Cholla bread. The culinary scape of Kolkata has benefitted from the migrant communities and for the first time The Calcutta Cookbook: A Treaury of Recipes from Pavement to Palace (1995) by Minakshie Das Gupta, Bunny Gupta and Jaya Chaliha from the Penguin Books brings to the readers “a treasury of recipes from pavement to palace”. The book is useful not only for novice cooks, efficient cooks or experimental cooking but it also traces the culinary history of Kolkata beyond the kitchen which makes it an interesting book for those working on anthropology of food. The book begins with a collection of recipes which people ate before Job Charnock landed in Kolkata. What I love is that they actually pen down the recipe of Gota Siddho ( Casserole of Whole Moong Beans and Vegetables) which is eaten during Saraswati Puja ( celebrated on the occasion of Basant Panchami) to Anda Halwa. The book is divided into Eight Chapters. 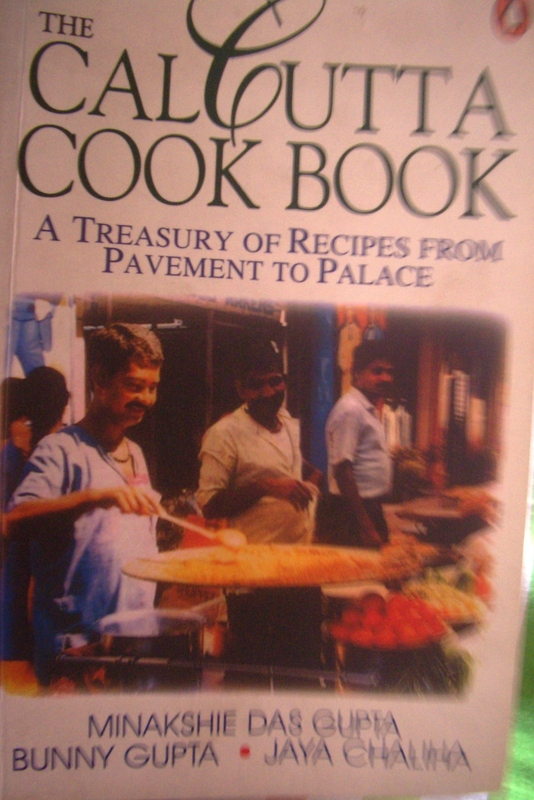 The book holds the reader through a pre-colonial history and philosophy of food (chapter 1) to a genealogy of bengali ranna ( bengali cooking) in chapter 2 and shows the way the way how the palate of Calcutta is enriched by the migrant influences from chapter 3-7 and finally chapter 8 shows how tables turned around the elaborate meal to buffet, brunch and baked beans to cope with post war time food luxuries. The second chapter is called Bangla Ranna where the authors describe the everyday life of a Bengali in Kolkata- where “fish itself is eaten from top to tail. 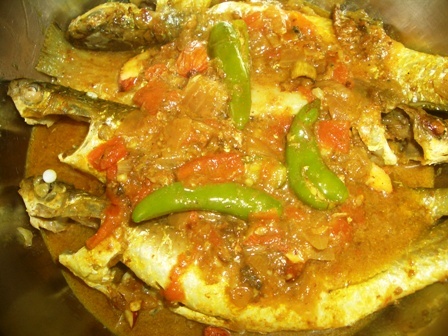 The head is cooked with dal or rice. The Bengali believes that the Fish head adds to his grey matter. The tail and bones are fried into delectable chachchari with herbs and red pumpkin”. 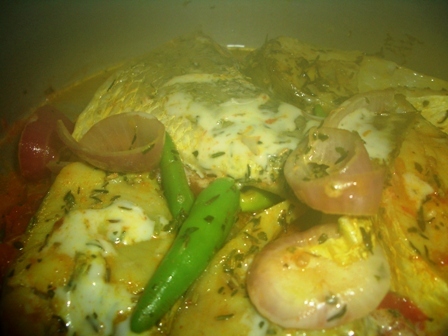 (pp 29) “… Thrift is an integral part of Bengali cooking. In this land of plenty, the good housewife is loth to throw away any part f a fish or vegetable” (pp29). In this preface to the collection of recipes the authors introduces the readers to the kitchen of a bengali household, cooking utensils, methods of cooking and most importantly shows how “eating is a ritual”(pp37). Next follows a collection of vegetarian and non-vegetarian recipes in a Bengali household. The collection is rich and varied, you can take your pick to cook up a Bengali feast. The third chapter is called Dastar Khwan which traces the history and recipes of Kebabs, Kalia and Qorma in Kolkata. “Muslim Cooking came to Calcutta’s Chitpur. The air around was redolent with the aromatic mixtures of Amburi and Badashah Pasand tobacco briquettes and kebabs turning on charcoal fires in front of walk-in eating houses on Chitpur road, once the only link between the town and Delhi.”(pp101). Infact the authors indicate that after the fall of Murshidabad, with Nawab of Bengal Zafar Ali’s entry to Kolkata the nawabi food. The abundance of fish and vegetables compelled the nawabi cooks to dish out Jackfruit Korma and Kancha Kala Kofta out of plaintains. The recipes are user friendly. Best picks are of course Halim and Paya. The scene now moves to the recipes and treasures that the Firinghees brought from Iberian Peninsula, northern Europe, France, Greece, the British Isles, and Asia Minor. Firstly the Portuguese arrived an settled on the banks of the river building “Catholic churches in the grey quarter of the town adjoining English Tank Square settlement, the pukka white quarter. Many of them came from Goa and Goan cooking added zest to the culinary fare of Calcutta” (pp148). Apart from introducing Sorpotel, one of the greatest contributions is locally produced cheese popularly called Bandel Cheese. “The small discs of salted smoked Bandel cheese were probably made by the Mog cooks under Portuguese supervision. The cheese is now made in Calcutta and sold as Bandel cheese in two shops in the famous not-so-new New Market”. (pp148) They were followed by the Dutch who settled in Chinsurah and then came the French who again chose Chandernagore. The most important contribution of French till date remains pau roti (loaf of bread). “Pau is said to be the corruption of Pain, the French word for bread. Pau, however, is the Hindi word for feet which leads others to believe that, as with the grapes in the vineyards of France, the huge quantities of dough were kneaded by stamping feet. But in fact Pau is the Portuguese word for loaf of bread” (pp151-152). This chapter also traces the contribution of Armenians, Jews and the British to the city’s social life through culinary ventures. The richness of the book lies in the culinary ventures of colonial Calcutta that the authors have traced and collected and brought into the forefront. One of the city’s heritage is the colonial past which continues to reproduce itself in the way city’s postcolonial “dining out” has been shaped. If one takes a look at the city’s long lost Great Eastern Hotel, Peter Cat, and the series of restaurants that occupy the centre stage in Parkstreet and different pockets of this postcolonial city we cannot deny the influence of the migrants that the city’s palate have had and this is what makes this book an interesting read. Steeped in the social history of Bengal, the book takes you through a journey of the “food” conquests of Bengal. A must read and a must have for all those who share a passion for culinary history of Calcutta and for those who want to re-create and re-live some of the recipes from history. Last Saturday I could not resist my temptation to gorge on one of my favourite fish, Parshe. My prayers were answered when I discovered to my relief that the last batch of Parshe was peeping happily from the cane basket. While I was buying Parshe, I could not resist the temptation of Bhetki. While the fisherman was cleaning my purchases I also gaped at the Katla fish head and was wondering if one could get hold of some Moong Dal and cook Machcher Matha diye Dal. While he cleaned and packed my fish into two separate bags I bought one Gandharaj Lebu. Gandharaj Lebu ( a variety of scented lime) is used as an accompaniment while eating dal and rice. And of course for all those who love Bhetki will remember its smell from Oh! Calcutta’s famous dish Gondhoraaj Bhetki. While I was all mentally prepared to dish out Gandharaj Bhetki when I was almost in the midst of my preparations on Sunday afternoon I realised that the jar for my mustard had few mustard seeds. So I had to rely on my senses for a steamed Bhetki- which was a truly hybrid dish of Pasta Herbs, and cheese. Before I go on to share the secrets of “Tomato- Cheese Bhetki” let me take you through my “Parshe Kalia”. Marinate the Parshe in salt and turmeric and leave it aside. Add oil and a little bit of ghee and lightly fry the fish and keep it aside. Parshe is a delicate fish like Pabda so be careful while frying. Take a medium sized onion and make a coarse paste. Add oil and fry the onion paste, one tea spoon of ginger garlic paste and 1 medium sized chopped tomatoes. Fry till the oil separates. Add salt and sugar for taste. I will insist that you add sugar because it will caramelise and blend well with the tomatoes Add the fried fish and garnish it with slit green chillies (4-5). Remember to slit the chillies else it will be bland. Let it simmer for some time and serve it with steamed rice. You can use Bhetki Fillet if you like for this. Marinate the Bhetki pieces or fillet in salt and turmeric. Take a shallow container/ a roast tray would be good. Add two tablespoon of oil and add garlic cloves till it turns golden and releases a pungent smell. Take two tomatoes and slice it in equal sized rings. Place the rings neatly in the pan and add the fillets. In a similar fashion chop some onions ( in ring shapes) and cover the fish fillets with onions. Though I used Pasta seasoning for this you could use oregano and thyme for this as well. Sprinkly generous amounts of pasta seasoning and close the lid. Check after 10 min and turn the fish fillets carefully so that it does not break. Take a slice of cheese and slice it into equal portions and spread it evenly on the fish. Cover the lid and let it cook for another 10 min and it is ready to serve. The Cold War- Galda Chingri or Hilsa? Today a friend of mine called me and reminded me that since I usually cook dishes which are famous in East Bengal I should let go of my inhibitions and accept the hegemony of the Bangals ( People from East Bengal) over the Ghotis (people from West Bengal are called Ghotis). The foodscape ( a term borrowed from Manpreet Janeja’s work) of Bengal has witnessed an age old cold war between Ghotis and Bangals and as Chitrita Banerji (2001) in her work argues, “people take refuge behind these terms to justify all kinds of closemindedness” (Banerji 2001: 39). To the extent, Ghotis by birth are fans of the football club – Mohun Bagan and Bangals usually support East Bengal Club. Any local football match to this date is described as a cultural war for pride and superiority of one against the other. And of course food- is the final stop for the difference. So when Mohun Bagan players win a match against East Bengal they are felicitated with garlands made of specially ordered Galda Chingri (King Prawns) – symbolic of Ghoti food. When East Bengal wins a match against Mohun Bagan they feast on Hilsa- symbolic of Bangal food. In other words these two football clubs are beyond Bengali pride – they are rooted in Bangal-Ghoti divide as evident in a fan’s comments on a website created by Mohun Bagan’s fans. The fan writes, “I still remember that in my childhood, in the middle and late seventies and the early eighties, whenever Mohun Bagan would win a tournament or a match against East Bengal, there would be sweets and “abir” in our house and a general feast will follow. I still remember that day in 1978 when in the league match against East Bengal, Shyam Thapa scored a brilliant goal with his bicycle volley and my father and uncles came home from the field with roshogolla and chingri machh and we burst crackers and put abir on each other. If we lost to East Bengal, there would be no dinner in our house”. (http://www.mohunbaganclub.com/fspeak.html). The cold war continues to this date that matrimonial advertisements in newspapers often indicate a reference for EB (East Bengali groom/ bride) or WB (West Bengali groom/ bride). So the closemindedness that Banerji talks about marks every sphere of life. When it comes to food, Ghotis are known to add sugar in everything. A pinch of sugar according to my mother (an ardent Ghoti) would make all difference to the dish else it will start tasting like a Bangal dish. Bangals, again are known to eat hot, spicy food. While Ghotis would refrain from eating stem or peels of vegetables, the most innovative vegetarian Bengali dishes I must admit are the Khosha Chchoris which are usually cooked from the leftover peels of vegetables. For instance, a brilliant way of re-using the peels of lau is to chop them finely and fry them in mustard oil with green chillies and onion seeds. Add salt according to your taste. Similarly some of the stuffed vegetables with mustard paste are actually home medicinal remedies when you have a running nose. For instance today I made stuffed Kankrol with mustard paste which I picked from one of my Bangal friend’s grandaunt. Coming to my people, we are famous for vegetables we make with poppy seed paste. Nobody can make Aloo posto, Potol Posto or even Cauliflower Posto the way we do. We even add posto to our fish and chicken curry and of course we call everything Jhol. The signature dish of Ghotis remain Chingri Malaikari made of King prawns and coconut milk while those of Bangals remain Hilsa. Though secretly we have incorporated and exchange notes on Ghoti- Bangal recipes the divide remains as my aunt ( who is a Bangal) has abstained from indulging in cooking shutki machch( dried fish) in a Ghoti household. Similarly my cousin who is married in Bangal household is not allowed to experiment with Bangal dishes. Often people also organise polls on Ghoti vs Bangal on social networking sites and it is actually interesting to see the way collectives try to exercise their monopolies on certain foods to mark their identity. This cold war probably will continue because we will not bow down and say your food is better than mine. So instead of accepting the hegemony of one over the other it’s time we reap the benefits of the richness we have in these two cuisines.